Today we are going to share eight of our favorite Super Simple Squash Recipes. Not all squash recipes are savory and we are going to share three of our favorite sweet squash recipes too. Pumpkin cookies, pumpkin bars and buttercup squash coffee cake. 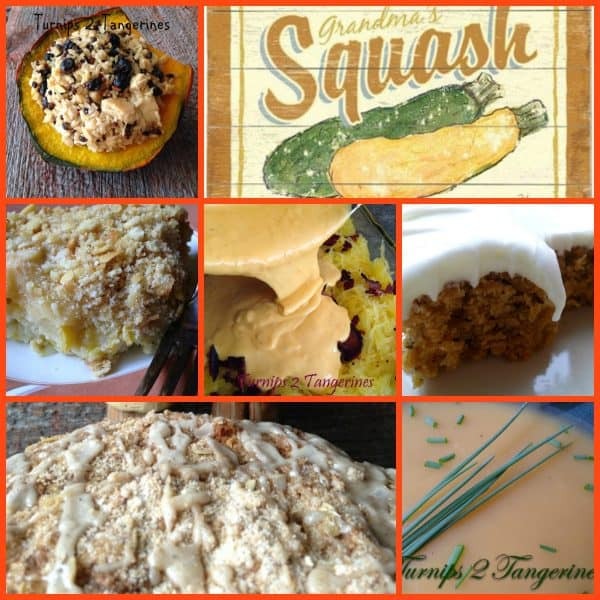 Come and join us as we celebrate squash and share our favorite recipes. We’ll share two recipes for summer squash and the rest will feature that fall powerhouse, “winter” squash. There are basically two types of squash, “summer” squash and “winter” squash. Summer squash favorites are; zucchini, patty pan and yellow squash. All summer squash have a soft, edible outer skin. All winter squash have a very hard outer shell that isn’t edible. Some winter squash favorites are; acorn, spaghetti, hubbard and kabocha. First on our list of Super Simple Squash Recipes is a delicious recipe for Brown Rice Medley Blueberry Chicken. A package brown rice medley is cooked according to packaged directions, combined with dried blueberries and cubed, cooked chicken. This mixture is then stuffed into squash and baked. Brown Rice Medley with Dried Blueberries and Chicken is super delicious and makes a great all-in-one dinner. 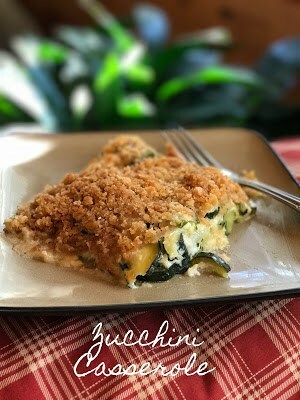 Second on our list of Super Simple Squash Recipes is a simple yet satisfying recipe for Zucchini Squash Casserole. Made with both zucchini and yellow squash, this recipe is one you’ll reach for over and over again. Easy, simple and so delicious. This super simple squash casserole is topped with one of my favorites, a buttery cracker crumb topping. 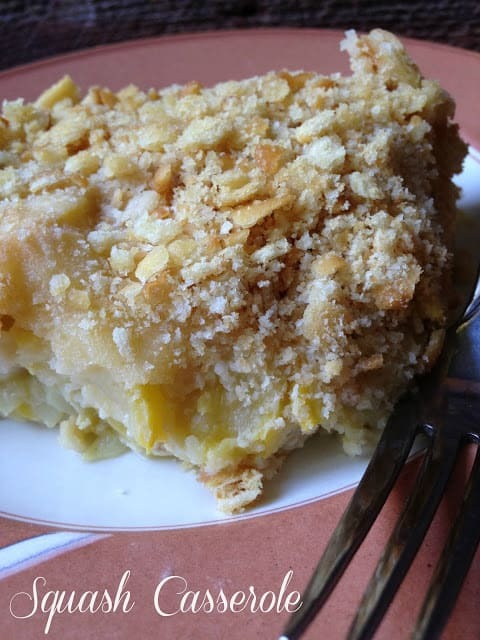 Third is another recipe using summer squash, Squash Casserole. This is another recipe that is topped with one of my all thyme favorite casserole toppers, a buttery cracker crumb topping. Made with crushed buttery crackers and butter. Easy, peasy, lemon squeezy. Fourth on our list of Super Simple Squash Recipes is for a favorite with all ages, Spaghetti Squash n’ Cheese. 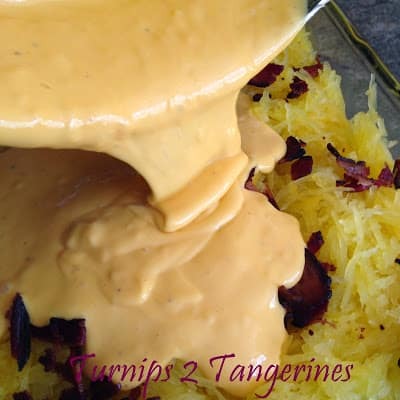 In this recipe, spaghetti squash stands in for the pasta normally used in mac n’ cheese, crisp bacon is added for smokiness and a home-made cheese sauce is made with a white sauce and Velveeta cheese. We like to use Velveeta cheese in recipes such as this one because Velveeta melts beautifully. Fifth on our list is a classic recipe that we have made many, many times. Each year when the weather starts getting cooler, and the leaves on the trees start changing colors, I reach for this recipe. It’s a great recipe to start off the fall season with here in Northern WI. 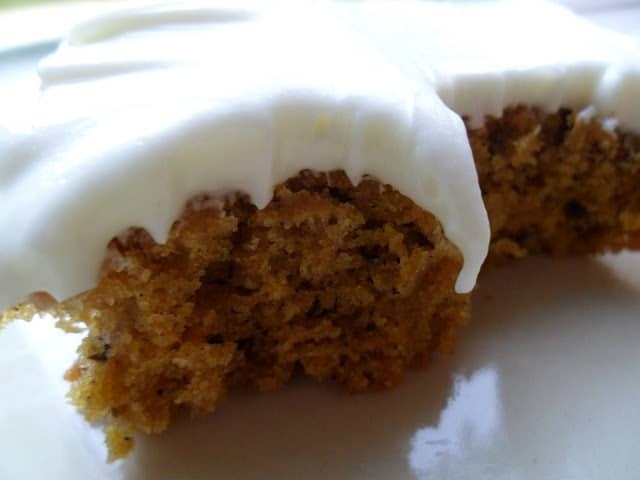 Pumpkin Bars with Cream Cheese Frosting was one of the very first recipes we shared here on Turnips 2 Tangerines, way back in 2012. Sixth is a delicious recipe for coffee cake using buttercup squash. 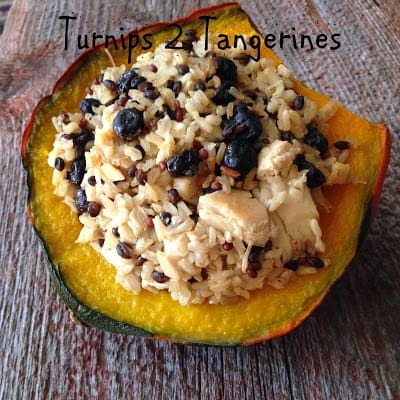 Buttercup squash is very similar to pumpkin or sweet potatoes in taste and color. Therefore you can use all three interchangeably in recipes. 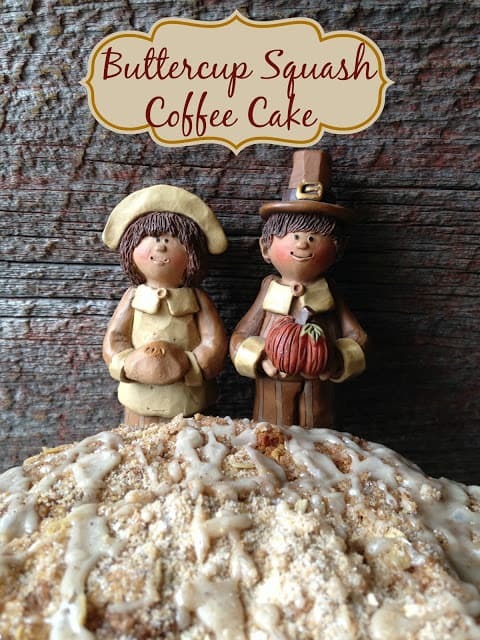 Buttercup Squash Coffee Cake has a layer of applesauce and streusel topping running through it. It’s then topped with extra streusel, then baked and is drizzled with a powdered sugar icing for that right amount of sweetness. Seventh on our list is for Pumpkin Cookies. If you have never made pumpkin cookies, you need to make them asap! 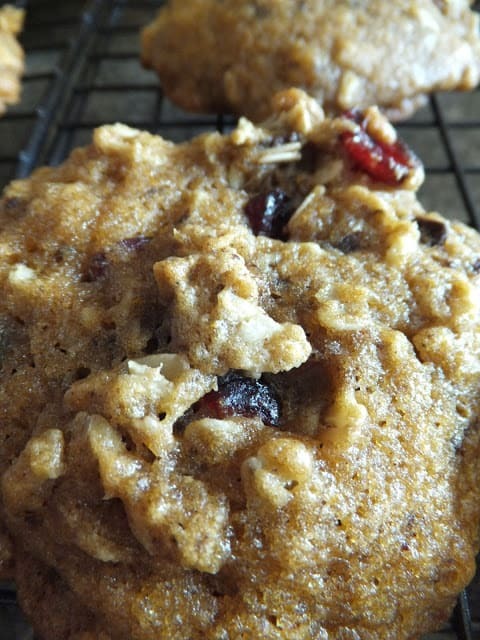 They are delicious, easy, and smell absolutely heavenly when baking. Another thing, the recipe we are sharing for pumpkin cookies makes a fairly large batch, which is great for fall bake sales. Take it from me, someone who loves cookies, these pumpkin cookies are fantastic. Eighth on our list is for a delicious soup made with squash, apples, carrots and celery. This soup is made creamy by using an immersion blender. 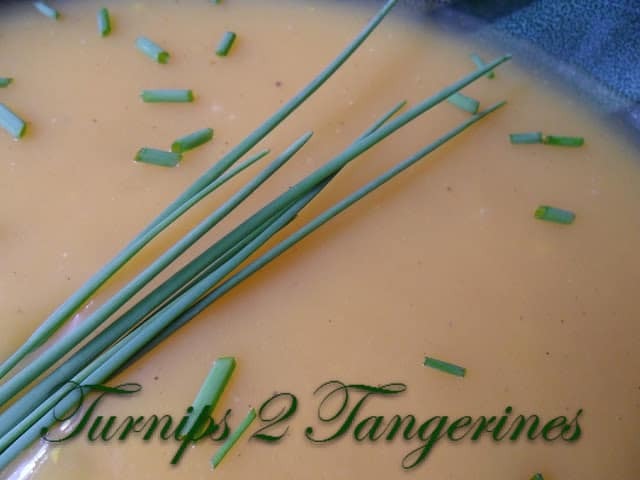 Creamy Butternut Squash Soup is super easy to make and is perfect on a chilly fall evening. We like to serve this creamy squash soup with packaged cornbread croutons or slices of cornbread. *For recipes using calling for canned pumpkin, we use Libby’s Canned Pumpkin.